Rescue has been a bit quiet here lately … which is a good thing when one considers the overall picture. No strays and no dogs surrendered by their owners. On the home front, it has been a bit hectic, however. 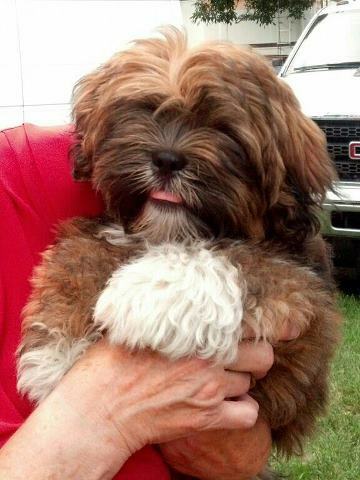 The end of August, I flew to Minnesota to meet up with friends, attend a four-day dog show and pick up a new puppy. My retired champion, Dante, sired a litter in Canada and we were there to evaluate the puppies and bring home the new little one. Meet Apsolutely FFT Tell Me No Lies a/k/a “Teller” (yup, that’s a red Apso!). He did just fabulous on the trip home, including sitting calmly on my lap in the airport watching the travelers go by and sleeping in his Sherpa bag during the flight with nary a peep. Given that it’s been seven years since we had a puppy in the house, there’s been a learning curve. Potty training is a challenge and I’ve had to refer back to my own article a time or two. Thank heavens for belly bands and hardwood floors! The kitchen floor by the water bowl is scrubbed daily as puppy can’t get a drink without getting his whole beard wet and trailing water through the kitchen. Frankers has earned the nickname of “Uncle Grumpy.” Thankfully, Teller is respectful of the old man and will back off with a correction from Frankers. The geriatric resident — Boogins, the cat at 15.5-years old — isn’t so fortunate as the puppy is fascinated with him. The house looks like it’s inhabited by toddlers with toys strewn from the kitchen to the bedroom and everywhere in between. Last night Teller came flying into the front room with a bath mat in tow, shagged out of the master bath. Other times, it’s a crate pad from the master bedroom. And he’s certainly not above running off with whatever clothing item that hits the floor. My last routine for the evening is gathering up all the toys and putting them back in the toy baskets … which reminds me of dusting the house. Wait 12 hours and it looks like it’s never been done. Can’t say that the subsequent baths have been any less loud or any less vocal. Just not as long! Given that Dante was very vocal about his baths for the first couple of years, it would appear that Teller comes by it honestly. While only 5.5-months old, Teller is quite well-traveled. From Canada to California to Minnesota to Colorado. He’s been through a puppy kindergarten class and has attended two conformation classes. Fall arrived in Colorado with some fabulous color in the mountains … and decidedly colder temps. The hard freezes have taken out the annuals and we’ll start the yard cleanup here shortly in anticipation of putting it to bed for the winter. Have a great fall y’all! First we have “Elwood” … did you know his name is Old English meaning “from the old forest”? 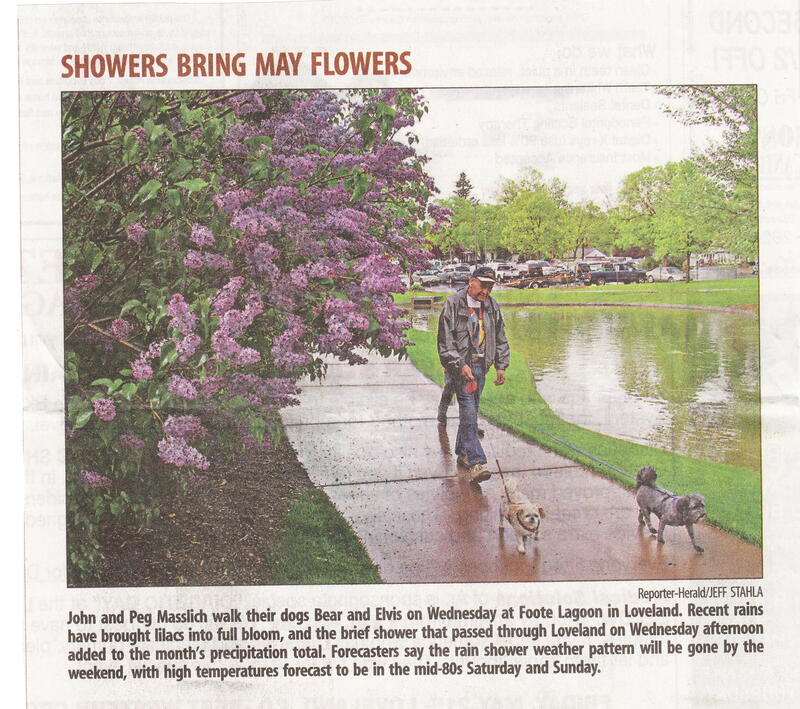 And just what, per chance, did I happen to find on the front page of Thursday’s local paper? 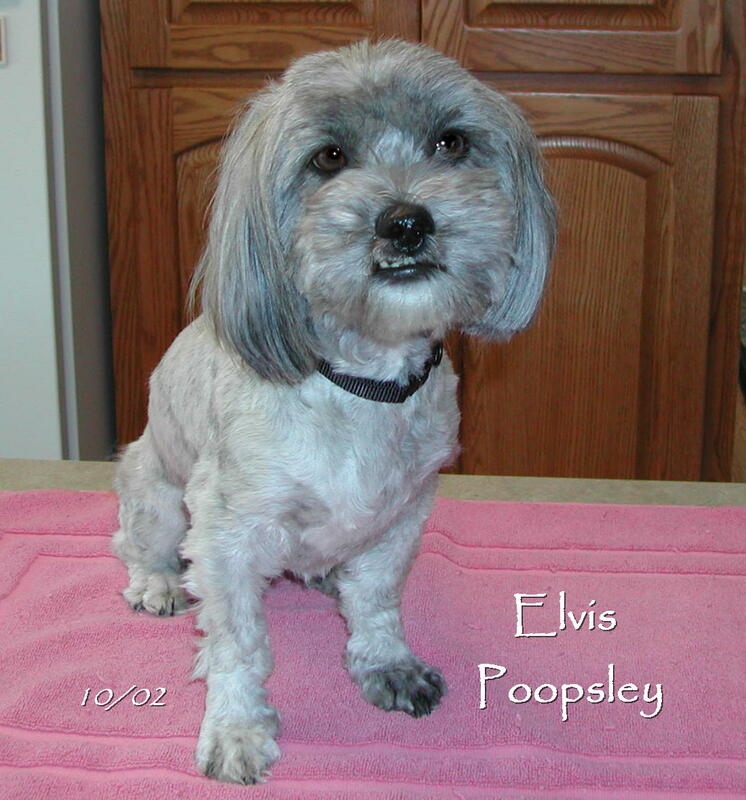 That would be a big “Elvis Poopsley,” thank you very much!! 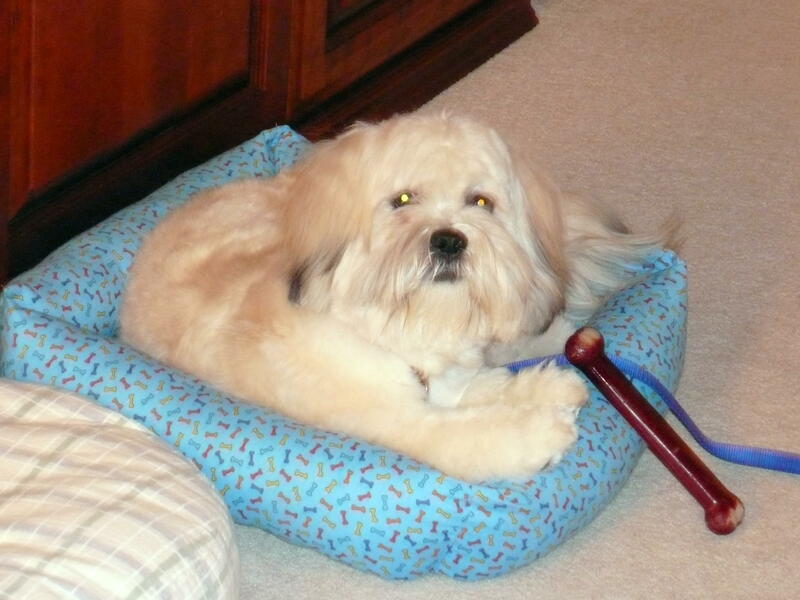 Elvis was the first stray ever surrendered to our organization (most of our dogs are OTIs, i.e., owner turn-in). Found by two ladies in metro Denver, he had been wandering a Capitol Hill neighborhood for weeks. Concerned about him freezing in the approaching winter weather, they bundled him up and brought him to Loveland. Fairly new to rescue, I wasn’t quite prepared for what greeted me. He looked like he’d been on the streets for some time as he was matted to the skin so badly it was impeding his ability to walk. The mats on top of his paws alone were at least an inch thick. Because of the smell emanating from him, I was concerned he might have open wounds somewhere. 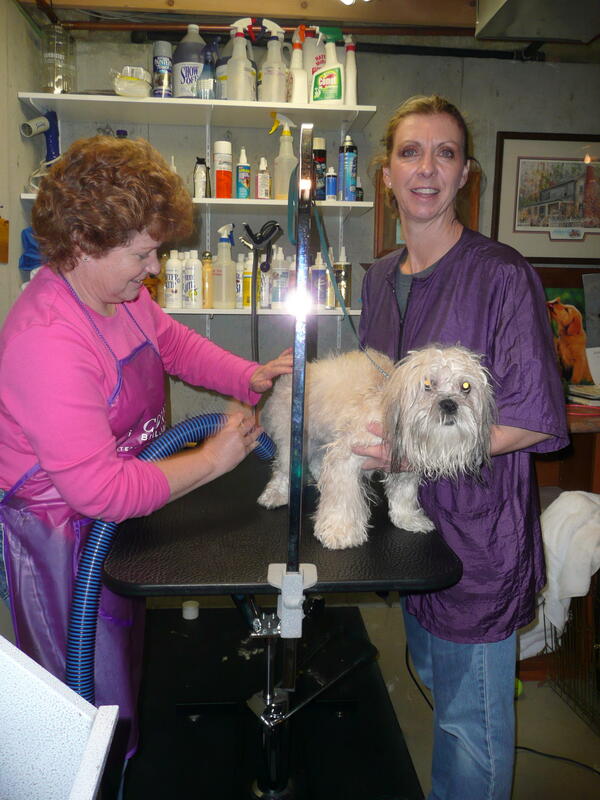 Of course, this was late Saturday afternoon and an opening with a “real” groomer wasn’t to be found anywhere … poor Elvis was stuck with me. Not willing to make him wait another day in that condition, I started cutting the mats off him with a small pair of scissors. 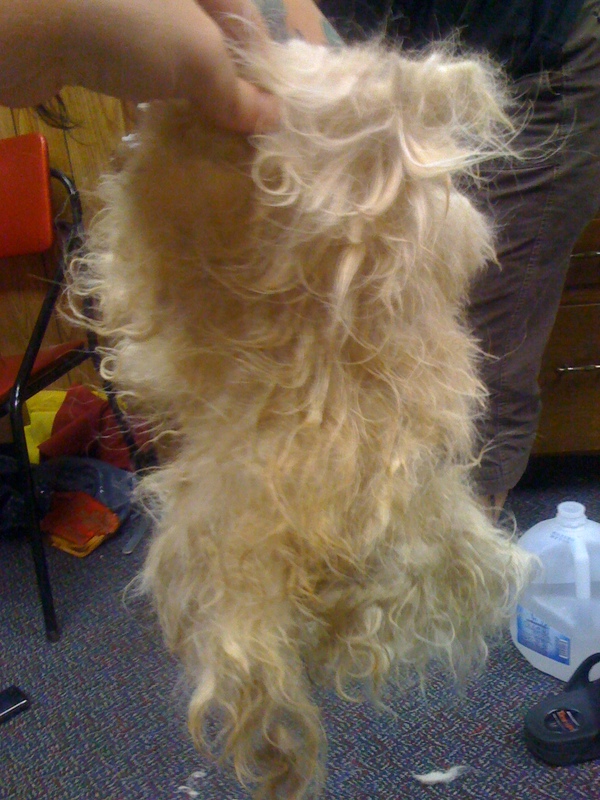 Four hours later and some nicks because the skin was so tightly adhered to the mat, we had a buck nekkid dog. A nice dog who didn’t once try to bite or nip at me despite having plenty of opportunity to do so. 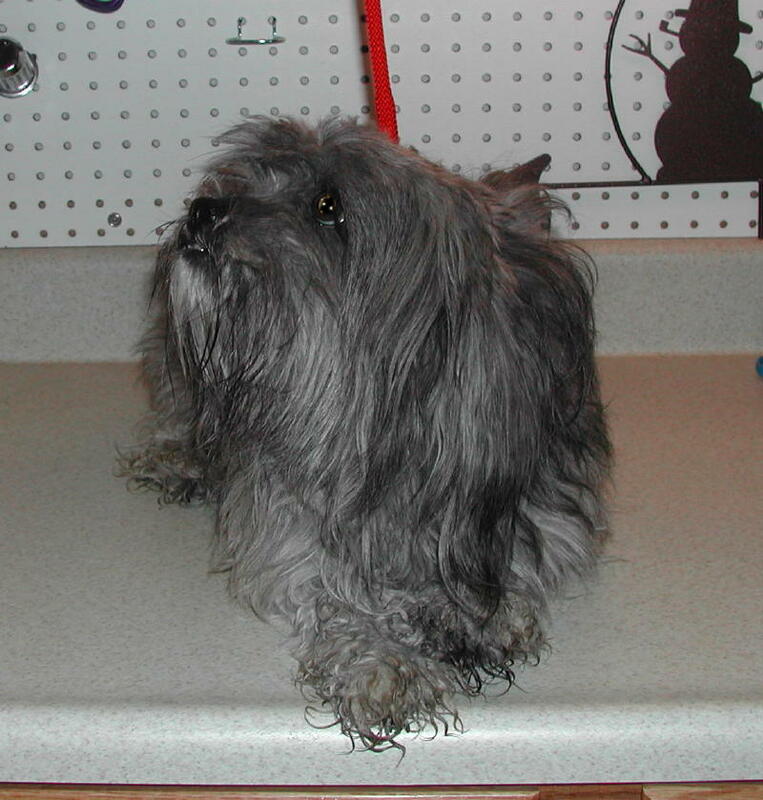 His color pattern was a bit of a surprise … he arrived charcoal gray and emerged a brindle after his grooming! One of the local radio stations was doing a tribute to “The King” that day and Elvis Poopsley just kinda fit, so Elvis it was. 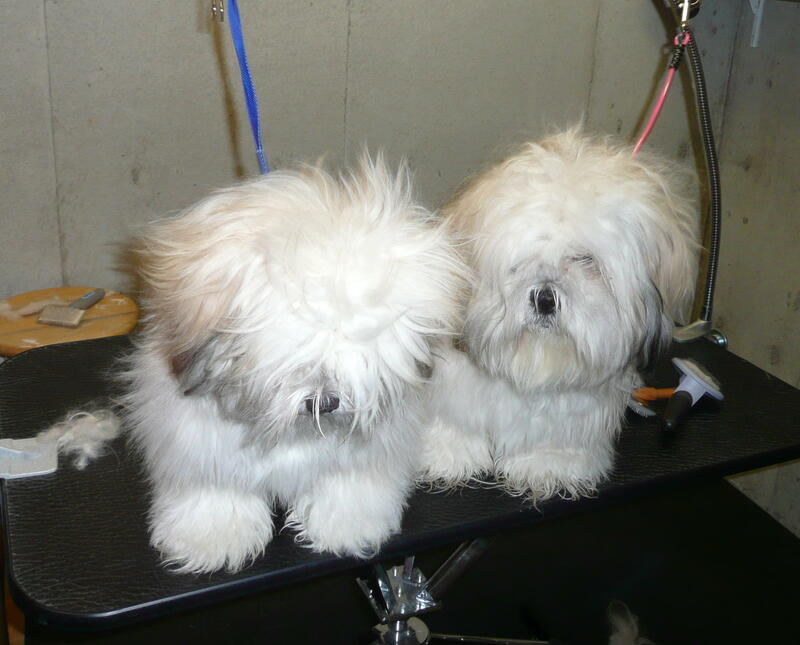 … we had two 8-month old Apsos home and clean. 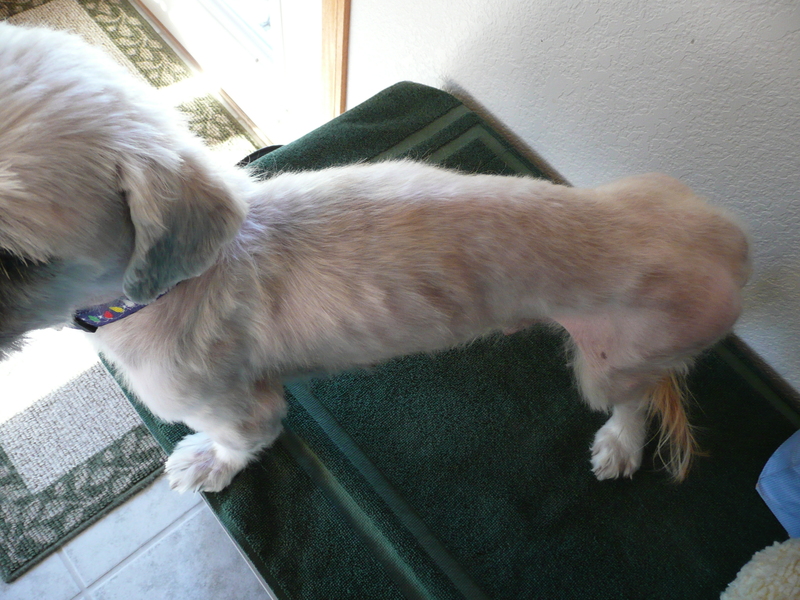 Not only matted but urine-soaked feet and bellies. It took three people and almost six hours to get them cleaned up. Matted to the skin in various places on their heads, muzzles and around the neck, chest and shoulders. Feces caked on the rear. These boys are horses … I’d guess they weigh 21+ pounds (to put it in perspective, my boys weigh 14.5 to 15 pounds at maturity). Golden in color with black tipping. And exceptional temperaments. Through it all, the only thing they offered were kisses. No snapping, no biting, no whining … that’s saying a lot given what it took to get them cleaned up. These little cuties … well, not so little … will be available for adoption in the next four to six weeks. They need to be neutered, caught up on their vaccinations and microchipped. We’re also in the midst of contacting a trainer/animal behaviorist to work on their separation anxiety. While they’re getting better, we want to make sure we’re doing all we can for them to ensure they are well-adjusted. Update: Spoke with the trainer/behaviorist today. She does not believe they have separation anxiety. As they lived in an apartment that didn’t allow pets, every noise was responded to by the owner so that behavior [barking] was reinforced by the attention. We’re ignoring the barking and it should extinquish itself in the next four to six days. We’re also using a D.A.P. diffuser and spray as a calming agent. 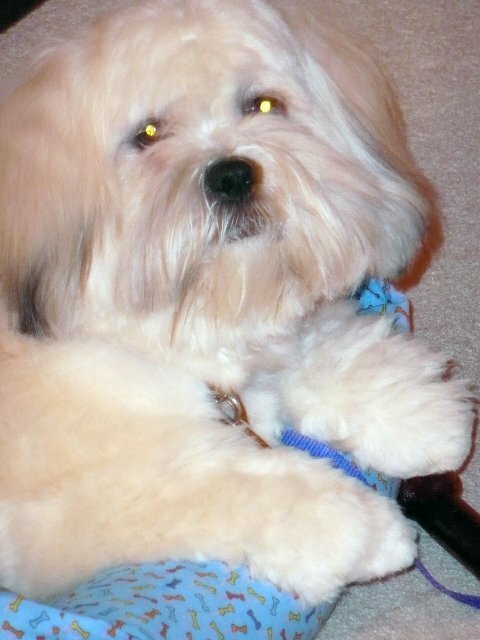 Having multiple dogs in the house … and grooming those dogs (mine and the foster dogs) … plus showing Dante, I’ve picked up a few pointers along the way from groomers and exhibitors regarding equipment and grooming supplies. I do all my own grooming (pet, show and foster) and recouped my equipment costs literally years ago. Figure $70 every six weeks for two pet clips = $606 a year … and that doesn’t even begin to add in grooming costs for the foster dogs or show grooming for Dante. Grooming gives me an additional chance to bond with the dogs, and for them, grooming day isn’t such an ordeal … and they always get treats afterwards! For those interested in doing their own grooming, I have two recommendations as a priority — a stand dryer and an adjustable grooming table. For the dryer, I recommend an Edemco and you have two good choices from PetEdge: Search Results … the ED70016 for $429 or the ED3002 for $319. Having a stand dryer will cut down on the amount of time needed to dry and you get to use two hands in the process. 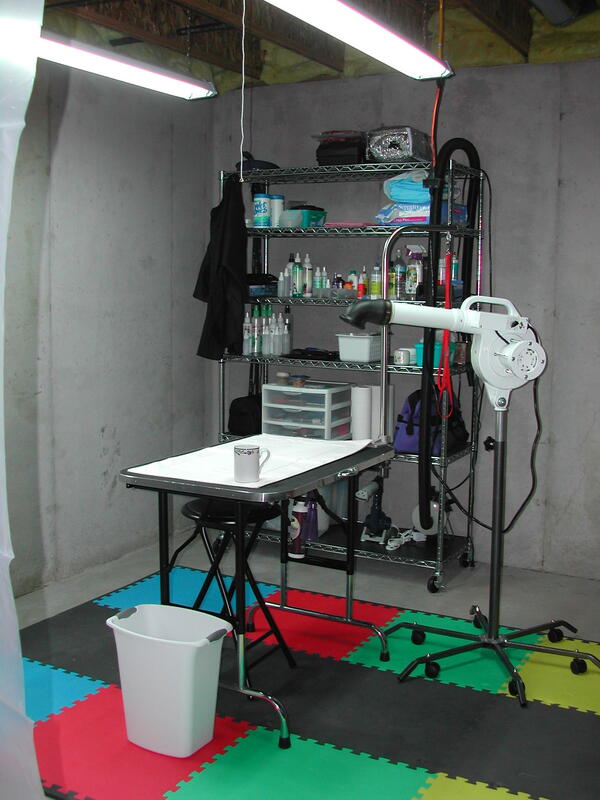 Basement grooming area ... "DogRoom"
I prefer an adjustable 36×24 grooming table for home use. Plenty of room and gives you the option of standing or sitting. My choice (and this is about half of what I paid nine years ago for the same table) … PetEdge: Master Equipment Adjustable Height Grooming Tables. Note the cushioned flooring in the main grooming area, purchased at Sam’s Club. Clippers and how to use them … Andis or Oster are two good choices. Because my basement is unfinished and without enough electrical outlets, I went with the Andis cordless model (which also means I’m not fighting a cord around a dog — a professional, we’re not!). 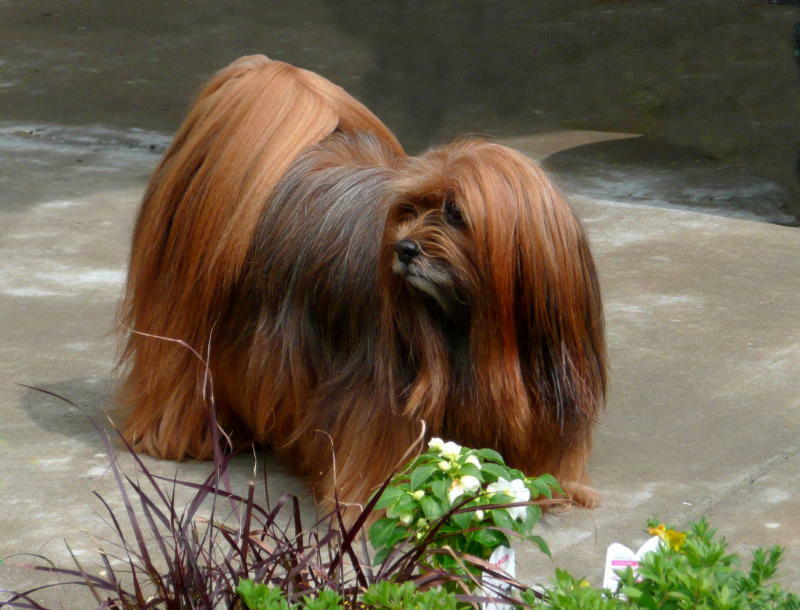 This video is a good choice for getting started as it goes over bathing, clippers and techniques … “Grooming Your Dog – Basic Haircuts.” One can also find grooming videos (Apso and Tzu) on YouTube with a quick search. Just keep in mind that it’s only hair and it will grow back … one does get better with practice! 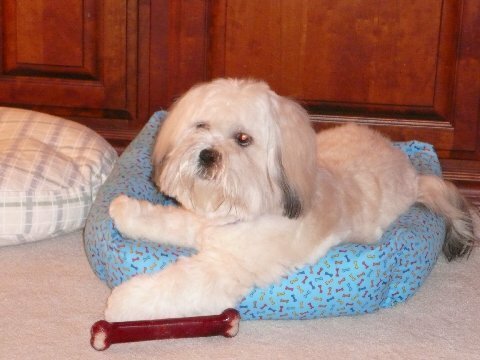 I have a grooming arm on the table (for the foster dogs’ safety) and recommend one from Table Works – Folding Grooming Arms (medium) as well as the tool caddy that fits the arm (use the side button link to see the caddy). The tool caddy is unbelievably handy and I wish I’d gotten it sooner. For those not wishing to purchase a stand dryer, the 24″ Table Works – Dryer Holder is a functional and well-built product. Don’t waste your money on any other brand (been there/done that). I can’t wait for the POS I currently have to give out so I can get one from Tableworks. Brushes. I’ve used All Systems, Mandan, Christensen and MasonPearson. I keep coming back to two … a Christensen pin brush and a bristle/nylon Mason Pearson. Am currently using the 27 mm oval Fusion Pin Brushes. It has brass pins and really does help cut down on the static generated. Christensen has a #10 Buttercomb 7″ coarse rat-tailed comb which is good for faces and putting in a part down the back … Combs & Handles… as well as the #000 Buttercomb 7.5″ fine/course comb for overall use. Christensen brush and comb “pins” are ground and polished which results in a smoother tip. There really is a difference … Tip Test. I do not use brushes with the little “balls” on the pin tips as this is hard on the coats (generally what one finds in the big box stores). If you use a slicker brush (great for pulling out undercoat), Christensen has those as well … Slickers. I have a Mark II that I use on the pet coats. I found the All Systems Dematting Comb to be a good investment for my coats all around. The Mason Pearson bristle/nylon brush I recommend is the brown Pocket size. With two types of bristles, it gently teases out tangles without harming the coat. Scissors. Definitely get what you pay for here … invest a little more. 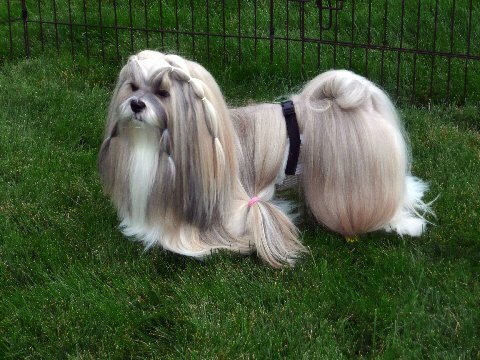 Suggest you go to a dog show and cruise the vendors, pick up and feel/fit the scissors to your hand. I’d start out with a straight pair, probably 7-8 inches, and a curved pair. Whatever you get, do not drop them as this can cause the blades to “nick” each other. And then you have a blade that doesn’t cut smoothly, which means you’ll have to have them sharpened at the next show you go to. I also like a small pair for trimming foot pads. 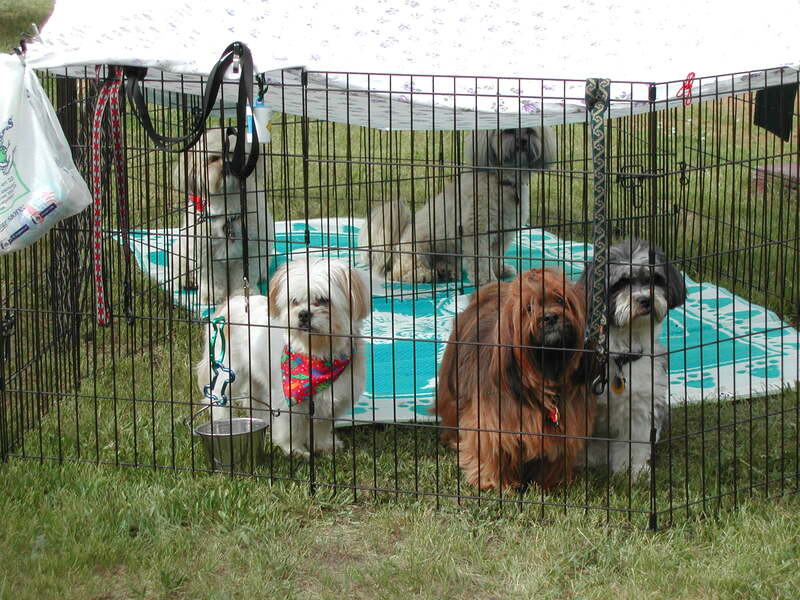 One doesn’t need to have a show dog to realize the benefit of having exercise pens, especially if doing a lot of traveling with dogs … J-B Deluxe Exercise Pen. Also handy are Ground Covers. Keeps the dog from getting soaking wet in the grass if it’s been raining. The urine flows through it, keeping the dog clean. Easy enough to clean up with a bucket of water, dries quickly and can be rolled up for storage/transport. Crates: I recommend a Mid-West 2-door crate in the 1624 DD model. The double doors (DD) are great for vehicle or home use. Also of benefit is a floor grate … Dog Crate Accessories – Midwest Divider Panels & Floor Grids for Dog Crates (#1624 DD) … and recommended because the plastic pan will cause huge amounts of static if in contact with the dog’s coat. 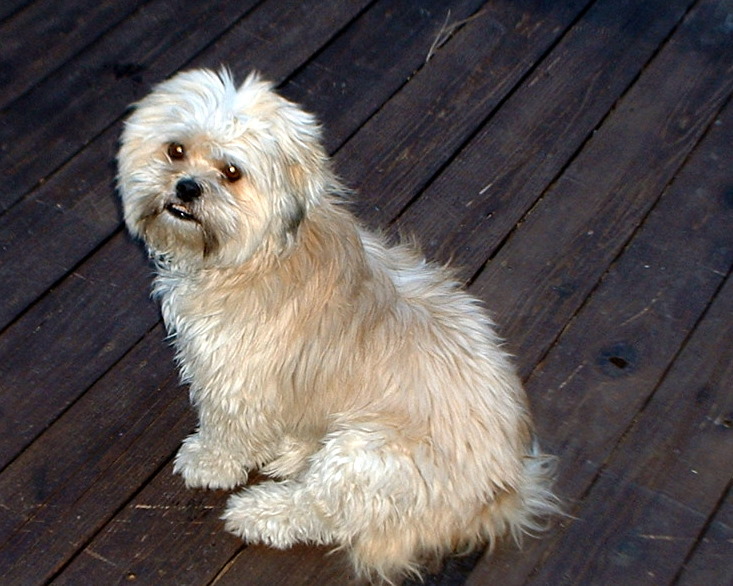 Plus, if the dog has an accident or gets sick, the dog stays cleaner as any liquid falls through the grating. And, yes, you’ll probably pay more for the floor grate than you will for the crate! While this is pretty much falls under show equipment (used to get gear in/out of a show site), it is unbelievably handy around the house/yard as well. I have this set up … MicroCart – ZZounds.com ($105 shipped … and you can read my review on the site). This next site, however, shows how versatile the cart is … Micro Cart. I had occasion to use it during an office move a couple years ago as well. If you have a male with housetraining issues, I recommend the adjustable Belly Bands from Small Dog Shop. They are more form fitting and, thus, more comfortable for the dog. Lined with a Depends or Serenity pad, they work great to contain male marking, keeping the boys and the furnishings clean. And the adjustable type allows you to use it on similar-sized dogs. In order to keep Dante clean on show weekends, he sports a belly band every trip outside. This also means I don’t have to give him a belly bath every day before we go into the ring. (Yeah, yeah, hubby says the dog folks are nuts …). Below is a listing of fav sites for both show and pet items. Note that some of the places have a “minimum order” charge so I usually get what I need from one place or make sure I have enough to get over the minimum or enough to get free shipping.